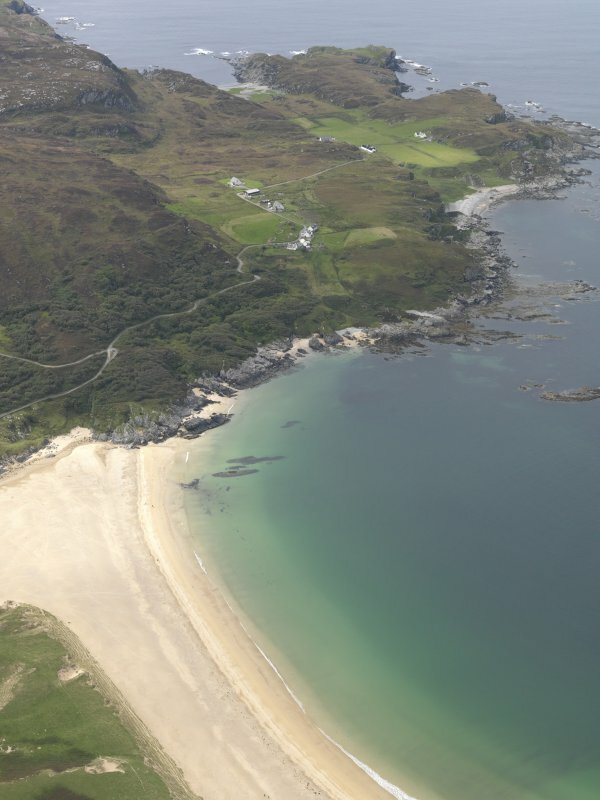 General oblique aerial view of Kiloran Bay looking towards Uragaig, Dun Tealtaig and Dun Uragaig, taken from the NE. A strong promontory site with only natural defences and a few circular huts, with a narrow causeway to the mainland on the east. "Tealtaig" contains a Norse element meaning "hut" (information from Prof Watson). NR 3890 9840: This promontory fort measures internally 46.0m NE-SW by 48.0m within a stone wall up to 1.0m high. The wall is best preserved in the S and SE where an outer face survives. Elsewhere steep cliffs provide adequate defence. The entrance is not apparant but could only have been on the S.
Within the interior on the N are four hut circles, levelled into the hillside and measuring from 4.3m to 8.5m in diameter. Bay. The site is protected by sheer cliffs or steep rocky slopes on all sides except the SW, where access is easy. proportion of earth, which was evidently an original element of its structure. A quarry has destroyed a section of the wall on the S. The position of the entrance is not clear, but it probably lay on the SW.
ground; and this area is now occupied by a number of small enclosures. Two of these (A and B on the RCAHMS plan) are U-shaped, share a common side and are formed by a low earth-and-stone bank; C is an oval scoop levelled into the terrace; and D is a rectangular area similarly levelled into the terrace and surrounded on the N, E and S by a low stony bank. Between B and C there is a level platform. The date and function of these enclosures are unknown, but A may be the foundations of a rectangular house, and B, C and D garden plots. Below the enclosures, and just behind the quarry, three shallow terraces may also have been cultivated. The remains of a fort are visible on a promontory on the SW side of the mouth of Kiloran Bay. Irregular on plan and girt by cliffs everywhere except the neck on the SW, it measures about 40m from N to S by 38m transversely (0.12ha) within a wall reduced to a bank of earth and stones that can be traced around the southern and eastern margins. The entrance is not visible as such, but was probably on the SW. Within the interior there are traces of several small enclosures that RCAHMS investigators suggested were a small rectangular building and some garden plots.